“My calves are killing me,” said Gavin Jayvin Wesley as he sat on a bench, dusk falling on the final day of the North American Indigenous Games (NAIG) in Regina. The Kashechewan member had just participated in the 800 metre, 1500 metre, 3000 metre, 4 x 400 metre relay and the eight-kilometre races. It was warm in the large open courtyard where earlier hundreds of athletes practiced during all hours of the day, a natural gathering for anybody looking for a place to rest or play. Gavin’s journey to the Games began in April, when Team Ontario coach Scott Haines called and spoke with Gavin’s father to invite the 15-year-old. 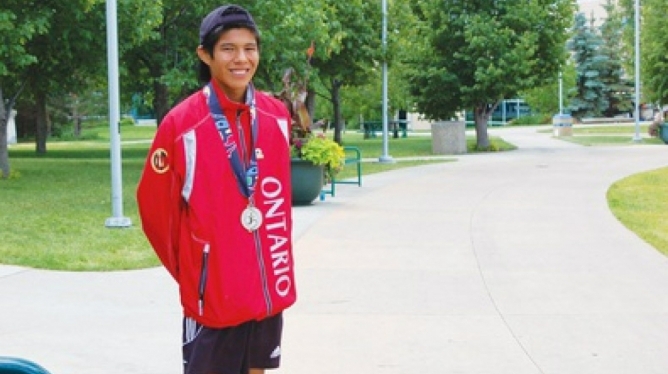 He had been spotted at a OFSAA Cross Country race held in November 2013. Gavin ran a 5.20K race with Midget boys and placed 17th out of 253 runners with a time of 19:05.